I live in a household of picky eaters, so finding a restaurant we can all agree on can be tough. We often go for pizza, because it&apos;s something everyone enjoys. Is there anything better than a hot, cheesy pie and some soft, garlicky breadsticks? 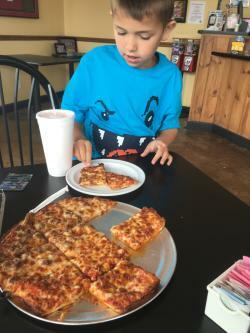 One of our favorite places to go for pizza is Danville&apos;s Pizza Paradise. Part of the Danville community since 2011, this family-owned eatery has tasty food and a laid-back atmosphere that makes it the perfect choice for families like ours. Though the setting is casual, the service is always excellent and very accommodating for families with young children. Pizza Paradise offers both hand-tossed and (our favorite) thin-crust pizzas. They have a variety of specialty pies, but you can also choose from the various toppings available to build your own pizza. On our most recent visit, we opted for a basic half-sausage/half-pepperoni pizza to feed my picky crew, but my personal favorite specialty pizza is the Category 7, which is described on the menu as all of the "island debris" on one pizza! I am also intrigued by the mustard-based Yellow Belly, and plan on trying it one day. 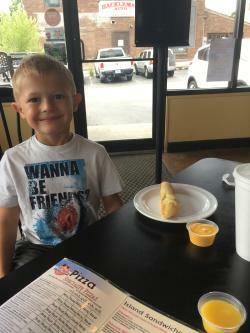 The breadsticks at Pizza Paradise are one of my favorite treats. They are light and delicious, and perfect for enjoying with pizza or on their own. The only thing I don&apos;t like about them is having to share with my family! If you&apos;re not in the mood for pizza, I recommend checking out one of Pizza Paradise&apos;s sandwiches or calzones. The Hot Ham and Cheese sandwich is particularly tasty. They also offer really great wings (try the Cajun Garlic! ), spaghetti and a salad bar. One final thing we really love about Pizza Paradise is the location. Pizza Paradise is perfectly situated in downtown Danville, right around the corner from places like Court House Grounds and the Royal Theater. We recently enjoyed lunch at Pizza Paradise, and then walked down the street to see a movie! I love that Pizza Paradise is both convenient and delicious. Pizza Paradise is located at 55 E. Main Street in Danville, just east of the courthouse square. They are open every day for lunch and dinner. The next time you have a pizza craving, I highly recommend checking out this fun and yummy oasis!